Today is All Souls Day. Beliefs and practices associated with All Souls’ Day vary widely among Christian churches and denominations. I admit I struggle with saying soul so often in connection to my sweet, healthy, beautiful youngest child. Soul, cemetery, grief, spirit … All words which I almost choke on when I realize they are now connected to one of my children who should still be here living her life. I detest and resist being a grieving mother. There is not one effing thing about this title which makes sense to me. I want to scream or throw up from the reality that I have had this role forced on me against my will. While my faith has been shaken, my husband’s faith has served him well on the other side of Devastation Day. More than once he has comforted me with his interpretation of what he takes away from mass. Yesterday he came home after Saturday night mass and told me he had gotten a lot out of the mass because it was devoted to All Souls Day, which is today. He had mentioned this upcoming mass to me last week and I know he was secretly hoping I would go, but I am not ready. He casually mentioned that they were asked to pray for those who had lost their faith as a result of a loss of a loved one. Yep, that would be me. While he grieves Amy and misses her as much as I do, he believes that our Amy is in a better place and that her energy and spirit continues to surround us. He reassures me we will see her again. No one knows how important believing that is true; my survival depends on it. He and my sister, Danita, have been reassuring me since the very first day that our life was shattered into a zillion pieces, that Amy is fine. They never blink an eye when I ask them again and again if they still believe that Amy is ok. Quite frankly, there have been times when I would have lost my mind if I didn’t believe them. One of the readings yesterday comforted my husband so he printed this out as he does other words he finds comforting to him. I honestly don’t know what to make of all of this but my blog is where I keep my grief stuff so I am posting this for me more than anyone who stumbles across this post. Mainly, because I cannot preach what I still struggle with so its not meant to be debated. I respect everyone’s right to believe or not to believe and I especially respect my husband’s strong faith which has helped me to keep the door open to finding mine again. Things have happened which convince me that my daughter is still close to me and that’s what gets me through the night. She sends us amazing signs but of course I want more. And more than anything I want her back. So my posting is just words that I may want to revisit which may or may not help me. In the meantime, I will light my daily candle for my Amy’s soul; maybe I will light two today since it’s All Souls’ Day. 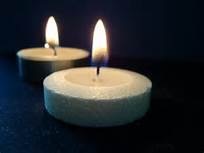 The second candle will be in memory of all the beautiful children whom I have learned about as a result of this blog. From the bottom of my broken heart, I am so very sorry that we share the title of grieving parents. It’s just not fair. Remembering my Amy and your beautiful children today. I lost my 8year old daughter last july17,2014. Now and always I am not okay. I feel what you feel right now. I am really really sad. Oh Wilda, I am so very sorry. I know how much it hurts and I wish I could say something to make you feel better. Just know you are not alone. I hope you have a good support network. I am so sad for you and so sad for me. It’s just not fair. Wishing you glimmers of peace. The words bring only so much comfort. I can believe much of the time, but when I falter, my world spirals. My John and Ana keep me on track, but I fear it takes so much out of them to keep convincing me. Thank you for remembering. Sending you hugs my friend. Thank you Mira. I think the grief makes us doubt everything some days. I am glad that you are surrounded by loving believers. Lighting a daily candle for Amy is a beautiful thing. The eternal flame of love. Jennifer, that is a beautiful way to put it. Thank you. I am so very sorry for your loss. I think most parents do struggle with their faith after losing a child which is so sad because it’s during this time when we need it the most. I am open to finding it again but it will take time. Lighting the candle each night helps me to feel as though I am doing something for Amy and gives me an opportunity to tell her how much I love her and how grateful I am that she is my daughter. Peace be with you. Please post here any time you need a friend. You are not alone.